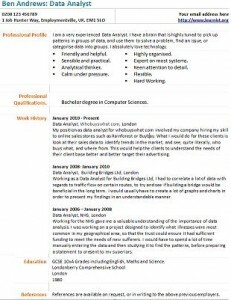 Data Analyst CV example and template. Amend as suitable and use it for yourself. How do I find Data Analyst jobs and apply? There are thousands of Data Analyst job vacancies on the job site online including cv-library.co.uk, reed, totaljobs, jobsite. All you need to visit them and start searching for suitable positions that are near you or you are prepared to relocate. – If you have any questions about your career then visit our job seekers forums today. – Click here to view cover letter examples. I am a very experienced Data Analyst. I have a brain that is highly tuned to pick up patterns in groups of data, and use them to solve a problem, find an issue, or categorise data into groups. I absolutely love technology. My position as data analyst for whobuyswhat com involved my company hiring my skill to online sales stores such as Rainforest or Buybay. What I would do for these clients is look at their sales data to identify trends in the market, and see, quite literally, who buys what, and where from. This would help the clients to understand the needs of their client base better and better target their advertising. Working as a Data Analyst for Building Bridges Ltd, I had to correlate a lot of data with regards to traffic flow on certain routes, to try and see if building a bridge would be beneficial in the long term. I would usually have to create a lot of graphs and charts in order to present my findings in an understandable manner. Working for the NHS gave me a valuable understanding of the importance of data analysis. I was working on a project designed to identify what illnesses were most common in my geographical area, so that the trust could ensure it had sufficient funding to meet the needs of new sufferers. I would have to spend a lot of time manually entering the data and then studying it to find the patterns, before preparing a statement to present to my superiors. Download Data Analyst CV template in doc format now and start working on it. These CV templates are the copyright of Learnist.org, 2012. Jobseekers may use these CV examples for their own personal use to help them create their own CVs. You are most welcome to link to https://www.learnist.org/data-analyst-cv-example/. However they may not be distributed or made available on other websites without our permission. If you have any question then contact us!